Sea turtles are not just a mere embellishment to the ocean. They, without a doubt, play a critical role to the sustainability of a marine life. Their existence has kept the marine ecosystem in balance for more than 100million years. Each sea turtle species uniquely affects the functionality of its environment by maintaining healthy seagrass beds and coral reefs, helping to balance marine food systems as well as facilitating nutrient cycling from water to land whether by grazing on seagrass, feasting on jellyfish, transporting nutrients from oceans to beaches and coastal dunes or supporting and providing habitat for other marine life. There are seven species of sea turtles that swim in the World Oceans and four of them- that are Green turtles or locally known as Penyu Agar, Hawksbill or Penyu Sisik, Leatherback or Penyu Belimbing and Olive Ridley turtles or Penyu Lipas, inhabit Malaysian waters. Sadly, these species have shown a significant population decline over the past few centuries and are on the brink of extinction. A female lays hundreds of eggs each time it nests but relatively only a few survive into their first year as its predators like crabs, monitor lizards, birds and fish eat the eggs or prey on hatchlings. Turtles that survive take decades to reach maturity and start breeding but rising mortality due to commercial fisheries, loss of nesting and feeding habitats, excessive harvesting of their eggs, pollution and coastal development mean fewer turtles live long enough to reproduce- an ironic turn of the species’ fate as turtles are known for their longevity in local cultures. According to the local marine ranger, Pak Din, there is a resident Sisik that has lived in Perhentian waters since he was a kid and it still comes up to lay eggs on Perhentian shores. It is well recognized by the Perhentian locals as it is handicapped for not having both its hind flippers. This makes it impossible for the distinctive turtle to dig proper holes during nesting that it fully relies on people to help dig holes each time it wants to lay eggs- displaying a great example of turtles and human dependable interaction. In dealing with the extinction of sea turtle populations, studies have been carried out including their migrations be it using satellite methods and tagging. According to the rangers, there are turtles found in Perhentian- a protected key habitat area that forms a part of the National Marine Park of Malaysia, with tags as far as from Vietnam and The Philippines as these gentle reptiles of the sea swim great distances and come on land only to nest. An effective turtle conservation also means protecting turtles at all stages of their life cycle which includes protecting the eggs and mothers from possible threats during the nesting period so that they are safely hatched into baby turtles as many as possible to have a chance of survival in the Ocean. There is a localized Hatchery Centre established in Perhentian Island in collaboration with the Fishery Department and various ecoNGOs. Realizing that everyone can make a difference by being more proactive to help protect turtles, Perhentian Island Resort (“PIR”) in Pulau Perhentian Besar also has adopted an ecotourism approach observed by its staff and visitors beginning 2016. 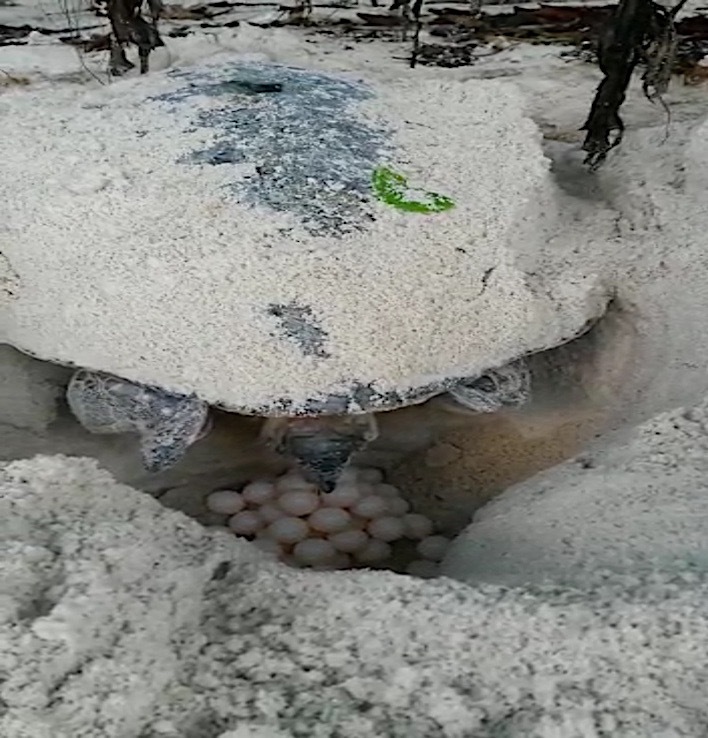 PIR has set out a Safe Turtle Zone on the resort beach with staffs volunteering to keep guard during nesting season between April to July, with the main purpose of ensuring that the eggs are safe from human intrusion. The eggs are sent to the respective local hatchery centre. Once hatched, PIR visitors will have the chance to release some of the baby turtles back into the ocean on PIR beach. Through this ecotourism approach, PIR hopes that awareness among visitors and locals on the importance of turtle conservation can be raised significantly in time, while helping in increasing the population of these endangered species in the Ocean including in our Perhentian waters. Picture : The resident Penyu Sisik that has roamed the Perhentian waters for decades distinctly recognizable from not having both its hind flippers laying eggs on Perhentian shores, in holes dug by local rangers.